RICHMOND, Va.--(BUSINESS WIRE)--Jun. 2, 2015-- MeadWestvaco Corporation (NYSE: MWV), a global leader in packaging and packaging solutions, today announced a licensing agreement with Burgopak Ltd. MWV Healthcare will market Burgopak’s award-winning medication adherence packaging, serving the pharmaceutical and animal health markets in the United States. Patient medication adherence is a globally recognized challenge, with an estimated 50 percent of patients not taking their medication as prescribed. Collaborative action to address this challenge is growing rapidly across diverse corners of the healthcare sector, including within the pharmaceutical industry. 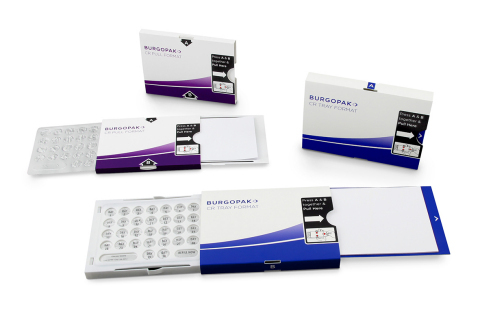 Burgopak’s adherence-enhancing package has won 16 awards. It offers a premium, unique functionality and presentation that can support a differentiation strategy for high-end or lifestyle pharmaceutical brands. Similar to MWV’s suite of solutions, Burgopak’s package increases adherence through improved communication and patient engagement. A calendar feature can be incorporated into the design, and the package also keeps the patient information leaflet and medication connected at all times. Like MWV’s adherence solutions, the Burgopak package was developed based on patient insights, which led to a design that’s convenient and portable to fit with users’ lifestyles. It is available with the highest level of child resistance, F=1, or without a child-resistance feature. Additionally, its tray-based carrier makes it ideal for use with blister materials, such as cold form foil, that are less suitable for other adherence packaging formats. For the past 10 years, MWV Healthcare has provided a suite of proven adherence solutions to branded and generic pharmaceutical manufacturers globally, as well as U.S. retail pharmacies. More than 700 million of MWV Healthcare’s adherence packages have been dispensed. This includes the Shellpak® family of packaging, which was featured in a peer-reviewed study published in Clinical Therapeutics showing that Shellpak improves persistence for long-term daily medications. MWV Healthcare is a leader in developing child-resistant packaging, and more than 40 of its designs have tested to the Consumer Product Safety Commission’s highest standard, F=1. MeadWestvaco Corporation (NYSE:MWV) is a global packaging company providing innovative solutions to the world’s most admired brands in the healthcare, beauty and personal care, food, beverage, home and garden, tobacco, commercial and specialty printing, and agricultural industries. The company also produces specialty chemicals for the automotive, energy, and infrastructure industries and maximizes the value of its development land holdings. MWV’s network of 125 facilities and 15,000 employees spans North America, South America, Europe and Asia. Learn more at mwv.com.